According to Boots Pharmaceuticals, their Fat Control tablets contain “a patented fibre complex of organic plant source, which acts to reduce the amount of dietary fats that are absorbed by the body”. To put it in simper terms they are fat binders. Fat binders are becoming increasingly common these days, and there are already plenty to choose from, but any product bearing the Boots Pharmaceuticals name usually deserves serious consideration. It is all too easy to consider Boots as being just another high street chemist with a range of own-label products. Few people realize that Boots was awarded the Queen’s Award for Technical Achievement, for creating Ibuprofen. As a manufacturer of medicines and supplements, the company deserves more than a little respect, but that does not guarantee all Boots products will live up to Boots’ high intentions and standards. Let’s take a closer look at their fat binding tablets and see how everything holds up. What are Fat Binders and how do they Work? Fat binders are usually taken up to half an hour before eating a meal that contains fat. This allows then time to line the stomach in readiness for the food that follows. Several ingredients are known to possess fat binding abilities and they all have two things in common. They have the ability to absorb and trap fat. What happens when fat is absorbed by something that cannot be digested? The two combine, the fat binder then carries the fat through the intestines, and the compound (fat binder + bound fat) is passed with the stool. Fat contains more calories than other types of food so too much fatty food can prove disastrous for the waistline and the health. Effective fat binders can considerably limit the amount of fat absorbed from food. Boots doesn’t say how much fat their tablets are capable of blocking, but many similar products can block up to 50% of ingested fat. Some can block even more. This review is in no way undermining the validity of Boots own products, in the main they are highly effective and provide value for money, in this instance with this product we feel that the formula is not as potent as its rivals. Boots don’t make any overly confident claims for their fat binding tablets. Only one claim is made on the box. Boots should be commended for their avoidance of hype, but they provide very little information about the product at all, including what the main ingredient is or who conducted the aforementioned clinical tests. This is a little disappointing. We expected better from Boots, but let’s not hold this against them too much because such omissions are the exception rather than the norm. Although Boots does not reveal what their main ingredient is, or how much of it is used, it seems highly likely that the main ingredient is opuntia ficus-indica (also known as prickly pear). Boots state the tablets should be taken immediately after a meal. Bearing in mind the way fat binders work this does not seem an efficient way to use the product. By the time the fat binder arrives in the stomach significant amount of fat may have already been absorbed (especially in the case of a long meal). The recommended dosage is two to three tablets, but if the meal contains an unusually high amount of fat the dose should be increased to three to four tablets. A maximum of nine tablets may be taken in any 24-hour period and Boots state tablet usage should be continued for at least six months or until the desired amount of weight is lost. Boots warns that their tablets are not intended for anyone under the age of 18. We further suggest that the formulation should not be used by pregnant or nursing mothers unless its use has been approved by their doctor. Anyone with health issues or concerns should also consult their doctor prior to using Boots Fat Control or any other weight loss supplement. *Note: Loose and greasy stools and/or more frequent visits to the bathroom are not uncommon when using fat binders. 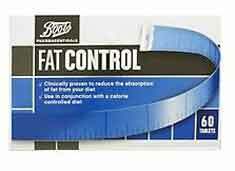 Boots Fat Control can be purchased from Boots the Chemist high street stores and from the Boots website. Each pack contains 60 tablets and usually retails for £22.99. Customers who have a Boots Advantage loyalty card can collect 88 points with each purchase. The credibility and reputation of Boots, both as a chemist and manufacturer cannot be doubted, but Boots Fat Control does not stand out as being one of their better products. The lack of information about what ingredient is used and how much is included means customers must buy the tablets due to their trust in the Boots brand rather than make an education decision to buy. Will the tablets work in the desired manner? Very probably, but with no customer feedback available and no guarantee, many customers may quite rightly decide buying an alternative product is a better option than just buying on trust. 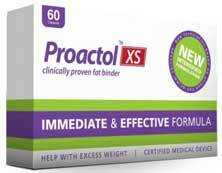 In the fat binding market there are three obvious contenders, Fat Control, XLS Medical Fat Binder and Proactol XS. Our Preference is for Proactol XS, Proactol has been in existence for several year and has adapted and tweaked its formula inline with its customers wishes (firstly Proactol the Proactol Plus). It is a dynamic product that is classed as a Medical Device Type II but available to buy direct with a prescription.